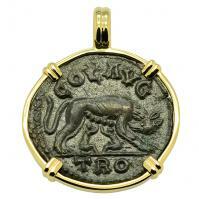 Roman Empire AD 330 - 333, She-Wolf Suckling Twins nummus in 14k gold pendant. 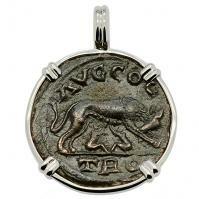 Roman Empire AD 335 - 337, She-Wolf Suckling Twins nummus in 14k white gold pendant. 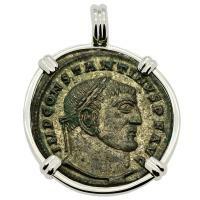 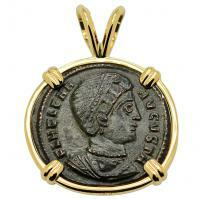 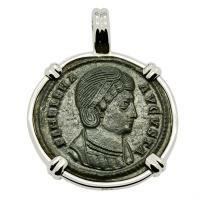 Roman Empire AD 315–316, Constantine & Genius follis in 14k white gold pendant. 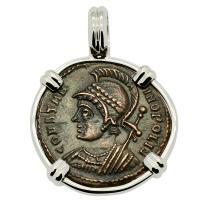 Roman Empire AD 334–335, Constantine & Camp Gate follis in 14k white gold pendant. 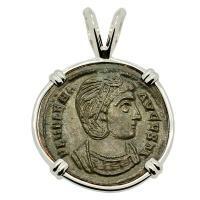 Roman Empire AD 310–317, Constantine & Sol follis in 14k white gold pendant. 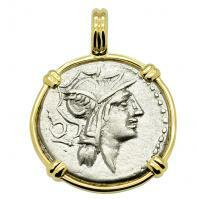 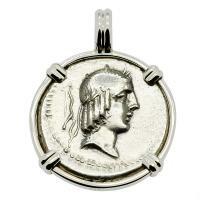 Roman Empire AD 332-333, Constantinopolis & Victory nummus in 14k white gold pendant. 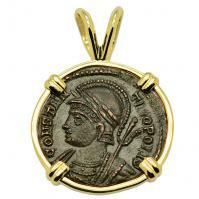 Roman Empire AD 332-333, Constantinopolis & Victory nummus in 14k gold pendant. 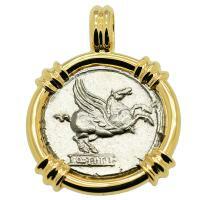 Roman Republic 90 BC, Pegasus & Mutnius Titinus denarius in 14k gold pendant. 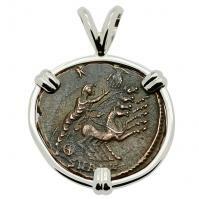 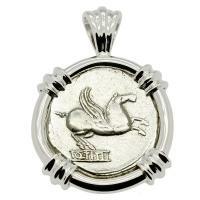 Roman Republic 90 BC, Pegasus & Bacchus denarius in 14k white gold pendant. 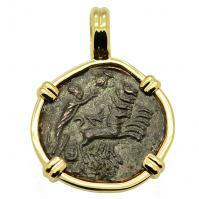 Roman Republic 103 BC, Mars & Warriors denarius in 14k gold pendant. 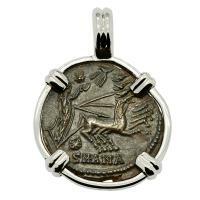 Roman Republic 137 BC, Mars & Warriors denarius in 14k white gold pendant. 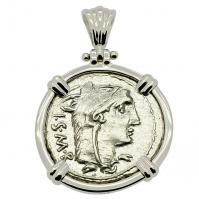 Roman Republic 103 BC, Mars & Warriors denarius in 14k white gold pendant. 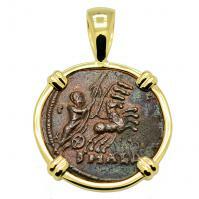 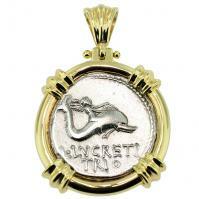 Roman Republic 74 BC, Genius riding Dolphin & Neptune denarius in 14k gold pendant. 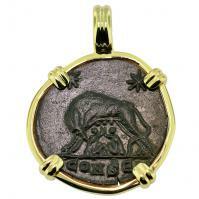 Roman Empire AD 250-268, She-Wolf Suckling Twins & Tyche coin in 14k white gold pendant. 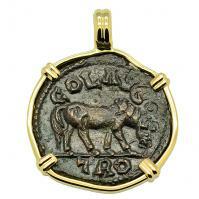 Roman Empire AD 250-268, Horse & Tyche coin in 14k gold pendant. 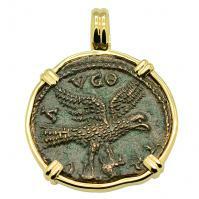 Roman Empire AD 250-268, Eagle & Tyche coin in 14k gold pendant. 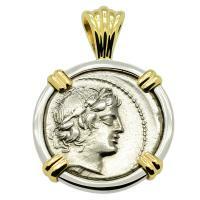 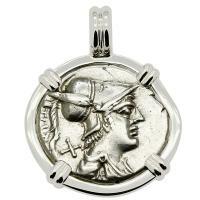 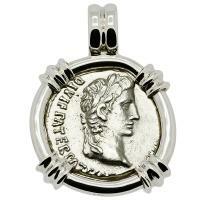 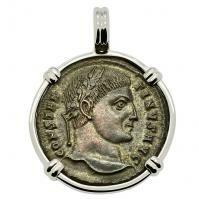 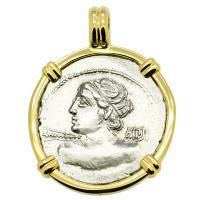 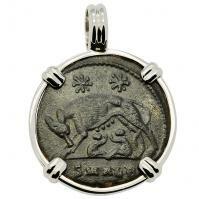 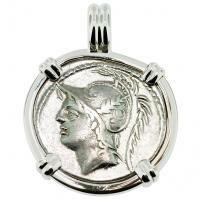 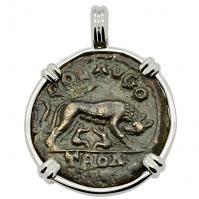 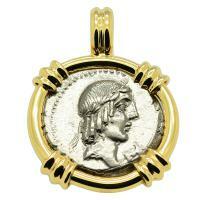 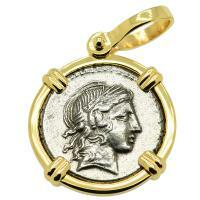 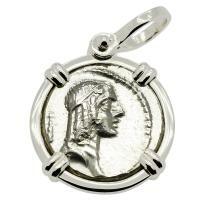 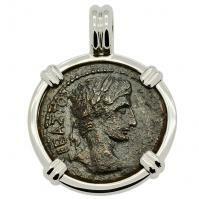 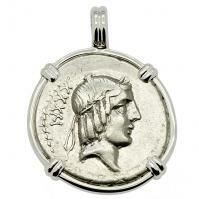 Roman Empire 16-14 BC, Emperor Caesar Augustus and Zeus semis coin in 14k white gold pendant. 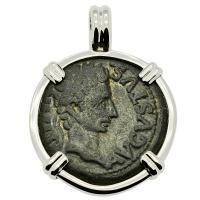 Roman Empire 27 BC - AD 14, Emperor Caesar Augustus semis coin in 14k white gold pendant. 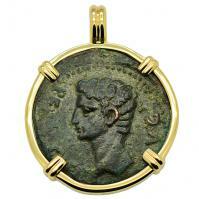 Roman Empire 27 BC - AD 14, Emperor Caesar Augustus semis coin in 14k gold pendant. Roman Empire 2 BC - AD 4, Emperor Caesar Augustus denarius in 14k white gold pendant. 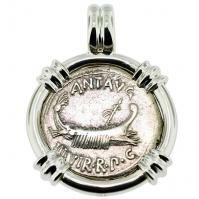 Roman Republic 32-31 BC, Mark Antony galley denarius in 14k white gold pendant. 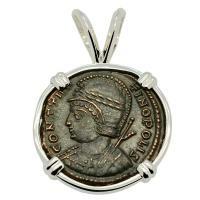 Roman Republic 105 BC, Queen Goddess Juno denarius in 14k white gold pendant. 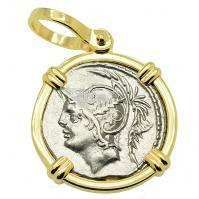 Roman Republic 91 BC, Roma & Victory Chariot denarius in 14k gold pendant.